In this post we cover the 10 best smart light bulbs for Google Home and how you can get the most out of smart light bulbs that work with voice control and Google Home. If you’re looking for a smart light bulb the options are almost endless but not all smart light bulbs that work with Google Home are created equal and picking the right smart light bulbs will make your smart lights easier to use and can help save you both energy and money. Smart light bulbs allow you to control the light bulbs in your home through wifi. All you do is remove your old smart light bulb, screw in the new smart light bulb, set it up through an app on your phone and you’re ready to start controlling your smart light bulb though your phone. With smart phone control of your smart light bulb you can turn on and off your smart light bulb from your phone and with some smart light bulbs you can even change the color of the light or dim or brighten the light. What can you do with Smart Light Bulbs That Work With Google Home? With standard smart light bulb configurations you can control your smart light bulb through your smart phone. Connecting your smart light bulb to Google Home opens up a whole new world of smart home and smart light bulb control in that it allows you to control your smart light bulbs using voice commands with Google Home. Adding Google Home voice control to your home is a true luxury and your smart home to the next level. I’ve lived with smart lighting control for 5 years and there’s nothing like laying in bed at the end of a long day and telling your house to turn off the lights with smart light bulbs for Google Home. To control your smart light bulbs with Google Home you will need an Google Home compatible device like the Google Home Mini, Google Home, or Google Home Hub. What is Google Home? What Google Home Devices Work With Smart Light Bulbs? Google Home is Google’s intelligent voice controlled home assistant. With Google Home you can ask your voice assistant questions you would normally ask google, play music, listen to news briefs or even ask the weather. These are the first smart light bulbs that I started my smart home with and they have worked reliably without any issues. I literarily plugged the hub into my router, setup the the light bulbs up on the Phillips Hue app and they flawlessly responded to the touch commands on my phone. Setting these light bulbs up with Google Home was a breeze. The Philips hue style smart light bulbs are probably the most popular smart light bulb that work with Google. In my opinion they are one of the best smart light bulbs that works with Google Home because they are simple to use, they have a good phone app, they easily integrate with Google Home and can be integrated with dozens of other apps for smart home control. 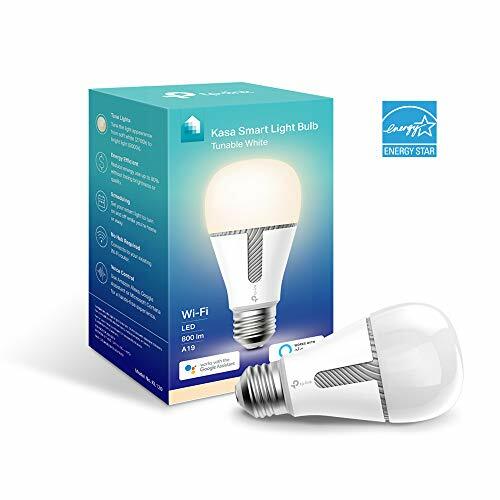 This smart home light bulb kit includes everything you need to get started with smart light bulbs, and these smart light bulbs are capable of dimming, and allow you to pick any shade of 16 million different colors. If you are looking for an Google Home compatible smart bulb and want every feature possible these smart light bulbs are for you. 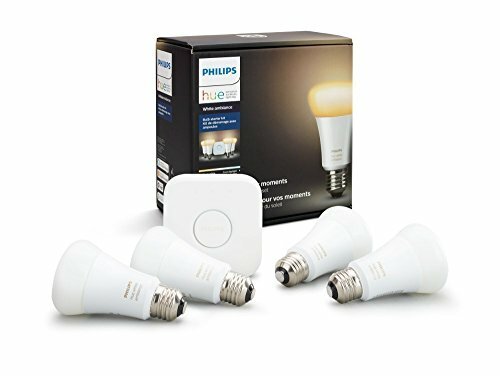 These smart light bulbs a require the Phillips Hue smart home hub control which comes with the Kit and is compatible to control any style or type of Phillips Hue Smart Light Bulbs. For those of you that are interested in the tech specs. The Phillips Hue light bulbs work on the zigbee home automation protocol, they are also stated to last up to 22 years so you can forget about needing to change your lightbulbs ever again if you install these in your home. These smart light bulbs that work with Google Home are unique in that they have full color control and dimming capability but don’t require a smart home hub like the Phillips Hue light bulbs. They typically are a little bit more expensive per light bulb but can make up for the cost because they don’t require you to purchase the smart home hub. LIFX smart light bulbs have been around a long time and have proven themselves to be high quality, reliable smart light bulbs that work with Google Home. The LIFX light bulbs work on directly on home wifi networks to provide quick response times and easy setup. To setup the LIFX smart bulbs that work with Google Home you just download the app, screw in the light bulb and follow the instructions on the app. They offer simple installation that is as easy as screwing in a light bulb. These smart light bulbs offer the same app and control as the multi-color Philips Hue smart light bulbs and will allow you to control your smart light bulbs with your phone or Google Home using voice commands but come only in white. Even though these don’t support 16 million colors like the full spectrum Phillips Hue lights they are still reliable, functional and are typically at a much lower price point than the full color smart light bulbs. My inner child purchased a 16 million color Philips Hue light bulb which I will admit I enjoyed for 15 minutes until my wife reminded me that I’m no longer in college, we don’t live in a dance club, I’m married and my choice in interior design used to consist of mounting sailing and outdoors memorabilia to walls as decoration. While I thought it was awesome and it looked like nice beach cottage, but the reality was that I was wrong, the same applies to the 16 million color smart light bulbs, the concept is great but the reality is you probably don’t need them. The white smart light bulbs from Phillips Hue are more practical, easier to control and work flawlessly with Google Home. I have few of the smart white light bulbs in my closets combined with a Phillips Hue Remote that allow me to place the remote inside the closet just like a built in switch. These LIFX smart light bulbs work in the same way as their full color LIFX counterparts but offer remote control in dimming in warm white. If you don’t want to purchase a control hub like the Phillips Hue Bulbs require these are a great way to get started with smart lighting. You can just buy one bulb with minimal investment to try out smart lighting that works with Google Home to see if you like using your voice to control your smart lighting. If I was staring out and was going to get just one smart light bulb, I would start by putting one in a night stand or bed side lamp, assuming you have a Google Home in your bedroom it’s easy to control your smart lighting with Google Home voice commands before you go to bed or when you wake up. Every night I use my Google Home with smart lighting to turn on and off my night stand light without needing to get out of bed to turn on or off the lights. It feels like a true luxury every night before I go to bed and love it. What I really like about the LIFX smart light bulbs that work with Google Home is the “warm” color of light that they put out. The “Warm White” color is closer to more traditional incandescent bulb colors and looks good in any home, some other colors of smart bulb are too blue and make you feel like you’re in a hospital waiting room or school. The LIFX smart light bulbs have dialed in the perfect shade of white for this smart light bulb that works on your wifi and provides an economical smart bulb option that’s easy to set up and get started with smart lighting. 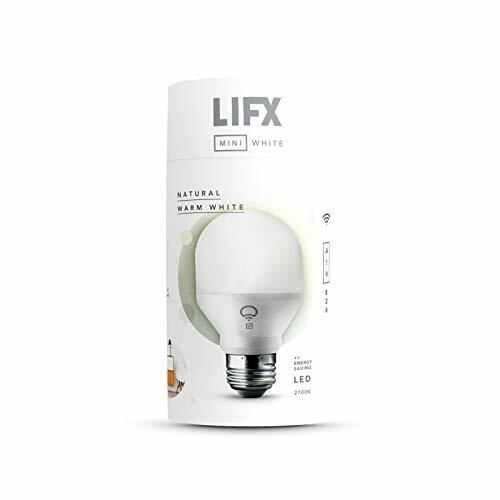 We rank this light bulb higher than the other smart light bulbs that offer white light bulbs because of it’s high quality and because it can be combined with other “color” LIFX light bulbs within your home to create scenes and controlled through the LIFX app. Both the Phillips Hue and LIFX light bulbs are accompanied by a full line of bulb sizes, light strips and light fixtures. 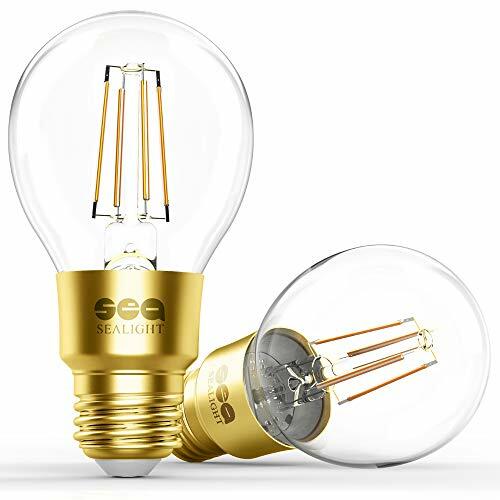 This sets these two brands apart from the rest of the pack because they offer so much flexibility in the light bulbs that you can use in your fixtures that you will most likely be able to find the right smart light bulb that works with Google Home for even the most unique light fixtures. These smart light bulbs that work with Google Home share some similarities to the the LIFX light bulbs in that they work on wifi and don’t require a smart home hub to operate. They are a great entry point in to the smart light bulb market to test out if you like your light bulbs controlled with Google Home voice commands. The smart Google Home light bulbs also allow dimming, app control and dozens of integrations with other connected devices and services. Sengled smart bulbs work with Google Home and offer one of the most budget friendly options for smart lighting on the market. They don’t include some of the same premium features and device integrations as the Phillips Hue or LIFX bulbs but they are very affordable. 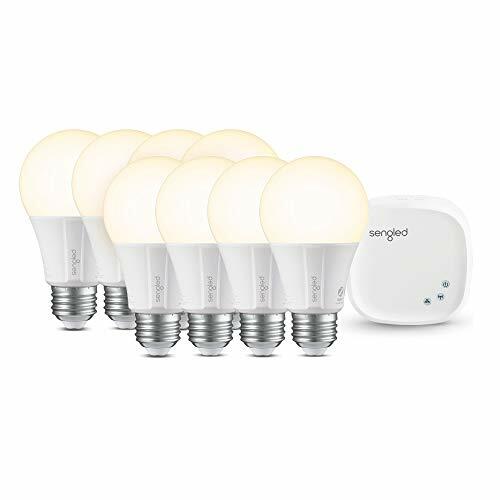 The Sengled Smart Light Bulbs that work with Google Home require either a smart home hub that can be purchased as part of the Sengled Smart Light Bulb Kit or they can work with Smart Home Hubs like the Sengled Smart Lighting Hub, Wink or Smartthings. The smart light bulbs operate on with zigbee networking protocol and then connect to Google Home and wifi for smart control through the hub and app. If you already have a smart home hub like Wink or Smarthings you can skip the kit and get the even more cost friendly individual smart bulbs for home control. If you have a lot of lights you want to convert to smart home and voice control these offer a no frills way to upgrade your home and add voice control with Google Home and remote app control of your smart home light bulbs. Simple, easy, inexpensive, no hub, wireless Google Home voice control. That pretty much sums up the Eufy smart light bulbs that work with Google Home. They don’t offer the frills of the other smart light bulbs and the app interface is simpler with fewer integrations and less options for control but it works reliably and easily. Just download the app, screw these in and you’re ready to go. They are one of the most inexpensive smart light bulbs on the market and can be less than 1/2 the cost of other competing smart light bulbs. 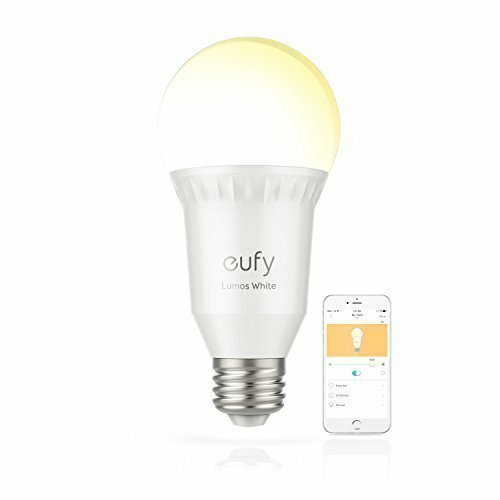 They don’t require a smart home hub, and come in soft white 60W style light bulbs. They work and you can outfit an entire house with them on a budget for full Google Home control of your lighting if you wanted. As a smart light bulb for app control and control with Google Home they work flawlessly, but they are less of a name brand than other light bulbs on this list and have fewer built in integrations with other smart home devices if that is important to you. 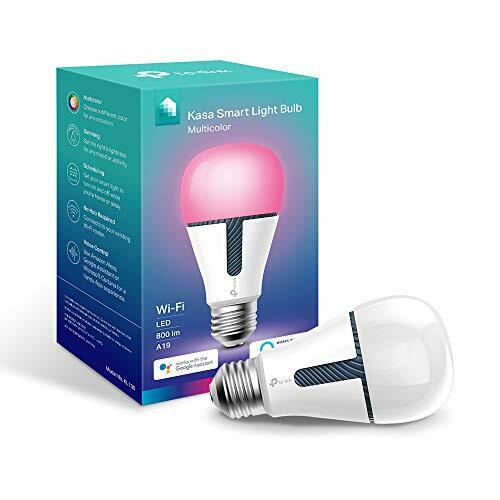 The Kasa Smart Wifi light bulbs work with Google Home voice commands and offer easy no hub, wifi installation of smart light bulbs with full color capability. These smart light bulbs operate just like the white TP link smart light bulbs and will work on the same app as other white TP link smart light bulbs and TP link smart hardwired light switches and dimmers. 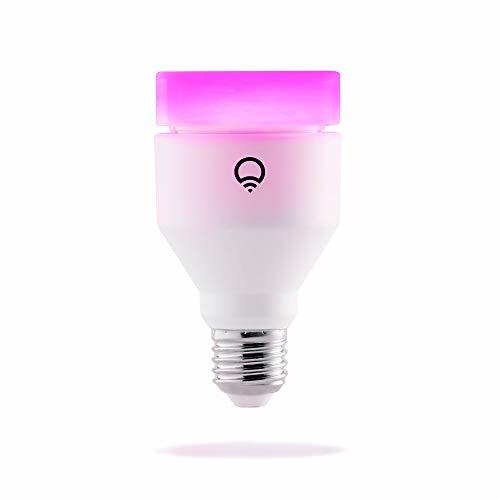 This is ranked lower than the other smart color light bulbs that work with Google Home because it does not offer near as many color options as the Philips Hue Multi-Color light bulbs. It’s still a great smart light bulb but limited in color. 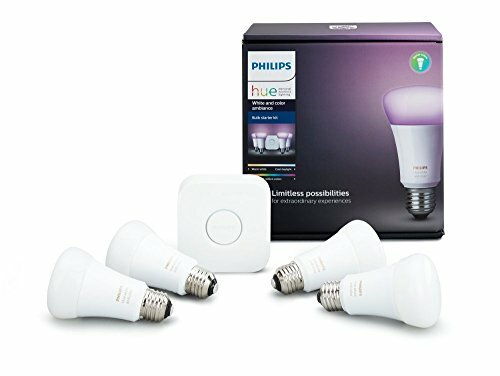 If you wan’t 16 million different color options an hues the Philips Hue smart light bulbs are the best bet, but if you already have other TP Kasa Smart light bulbs and want to add a little pizzaz to a light fixture or two these will do the job and work great just like the white smart light bulbs that work with Google Home. This smart light bulb that works with Google Home offers something most of the other smart light bulbs might lack….exceptional styling. Standard white light bulbs are great for can lights, lamp fixtures and other ceiling mounted light fixtures. However when it comes to suspended architectural light fixtures you need a light bulb that will look great, provide good ambient lighting and match the decor. These smart light bulbs that work with Google Home offer dimming functionality, timer settings and full wifi control from your phone. They don’t require a smart hub and work on the smart life app which is one of the most common and reliable smart home device apps that millions of smart connected products work on. If you are looking for just the right smart light bulb for your designer light fixture these smart light bulbs are perfect for setting the tone and providing smart voice control with Google Home. These smart light bulbs that work with Google Home aren’t light bulbs at all but light strips, so why are they on this list? 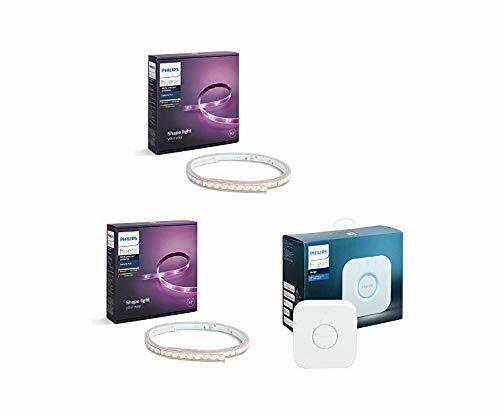 Well the Philips Hue smart light strips deserve and honorable mention because they are a great product but they also serve a wide variety of speciality applications that aren’t possible with the other smart light bulbs we have listed. These smart light strips will work with Google Home and work with the Philips Hue app just like all of the other Philips Hue smart bulbs and offer 16 million different colors. But what is most impressive about the Philips Hue Light Strips that work with Google Home is how they can be used. They are great for adding accent lighting below a cabinet either at hidden at the base of a cabinet or underneath an upper cabinet to illuminate your work surface.